Welcome to day on of the Bo Bunny blog hop of may! There will be not one, not two but THREE blog hops this may. Alot of fun, inspiration and prizes along the way!! If you´re on the right track you came to my blog from Frances.. If you get lost along the way you can always head over to our starting point. The very inspiring Bo Bunny blog! The prizes... Leave a comment on each designer's blog and a winner will be choosen from one designer's blog at random. You don't know which blog the comment will be picked from so make sure to leave a comment on them all. To be eligible for the second prize leave a comment on the Bo Bunny blog after hopping through all the blogs and one will be chosen at random. The winners will be announced next Wenesday on the Bo bunny blog. 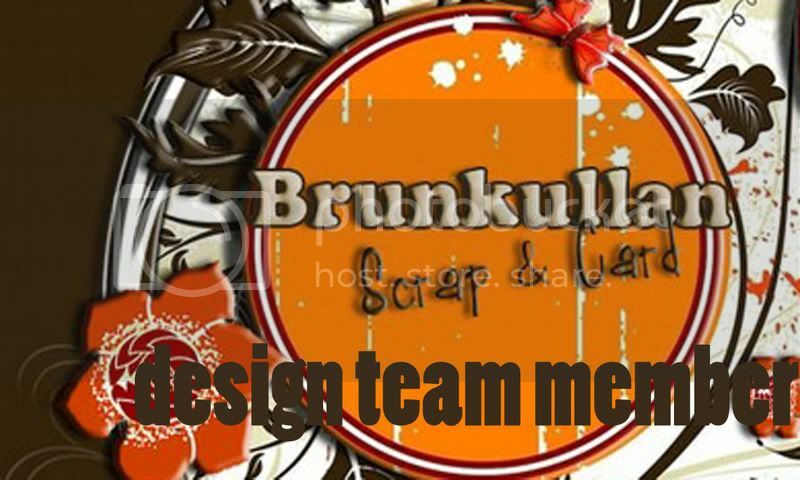 These are the very talented designers of today.. They are all so talented and I am so lucky to be a part of such an inpiring team. Mahlin <-------- you are here! Before you hop on to the very talented Janis I´d like to show you my latest Bo bunny layout!! 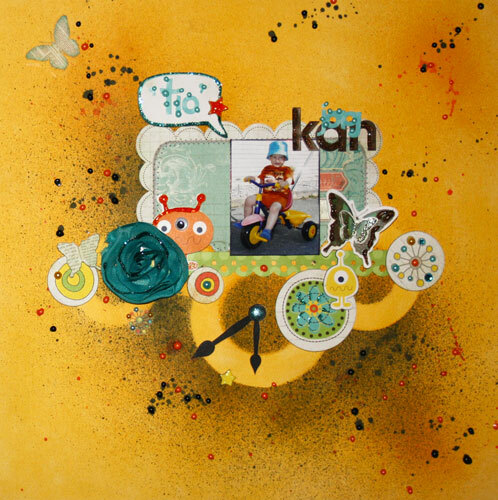 Double dot - Buttercup, Gabrielle - Elegance, Gabrielle - Dimensional stickers, Gabrielle - cardstock stickers,Gabrielle - Rubons, Gabrielle - 12*12 Chipboard, Blast off- Layeres chipboard , Time piece - Rubons, Time piece - combostickers, Ad lib - Hoopla, Ad lib - Noteworthy, Ad lib -petals, Ad lib - jewels, Ad lib - 12*12 chipboard, Ad lib - combostickers. Remember.. go visit Janis and have a great day! You never cease to amaze me, I so envy your misting skills. And this amazing layout is another example why:) Love it! Love your layout. Very bright! Jesteśmy zachwycone - zwłaszcza kleksami, smugami i cieniowaniem - baaaaardzo pomysłowe! ohhhhh this is amazing!!! YOu took what would normally be a pretty simple white space layout and just rocked its socks off with all of that misting or paint....WOW!! Very good job on the misting! Fabulous layout! I love the mixing of the two lines. What a great idea! Thanks so much! 599 kronor - ett kap! Ord. pris = 699. Love your layout. Great choice in colors..thanks for sharing. Oh my goodness but this is SO creative. WOW! love the use of mist on this layout! I really liked it, especialy the misting en masking. Great LO, I like your work very much! Great layout! Very different, but in a good way! Love the mist in the background! Great style and design ! Love the aliens on this layout. Very cute!! Super creative! The little aliens are adorable! great layout! love your misting! Fabulous! I love your style...I wonder if I can try this too?...so many ideas. Thank you! I'm not sure what country I'm in right now...no matter, colour and design of this layout are without borders. Fantastic! Åh så snyggt! Jag älskar alla färgerna och de små monsterna! Soooo Beautiful! I love all the colors and the pretty little monsters! Absolutely adorable!! I love the fun, messy look! So original and creative! The papers are fabulous! Love this bright and fun layout! I love the misting and the use of the timepiece hands! Great LO. Such beautiful colors. What a fun Layout. I like the colors you used and the details you can find on it. Thanks for sharing and the great inspiration. Love the mix of techniques used in this layout! Love you lay out, super cute. I'm always intimidated by misting and painting but your layout is so terrific that I want to try it! Love the design!! Its so sweet to see all the layering! Have fun, love all the misiting!! beautiful work...i'm at a loss for words! This is great, I love how you mixed the lines together...great misting action too! A beautiful layout with yellow this summer, that makes me happy. I went into your gallery and you are a Misty-Queen! Your layouts are alive and kicking!! Love the back ground you created. Wonderful layout! The colors are so fun and bright! Thanks for sharing! that page is so bright and awesome. i love everything about it! Postat av: Dee in N.H.
Can I just say WOW? That is gorgeous!!! I love the spritzing and the masks! Love it! I love the use of spray inks on your layout. Very cool ideas here! Very cute layout! Love it! I love the spray ink effect! Very nice! Love all the misting! Stunning! Your misting job is amazing!! This is so cherry and bright - very cute. Love all the misting and bright colors. The misting is nice. I especially like the big droplets you have. Oh this is so fun! Love the bright yellow and the paint splatters are a really fun look! I will have to remember to try it, I really love the look. I love the masking and misting work you do! Thanks for sharing! Love the misting effect. Wow...what a super cute page!! Very different , great layout. I like the misting spray effect. I really love your fun layout! Such a cute pic, and your masking/spritzing is amazing! Thank you so much for a chance to win some lovely goodies from Bo Bunny! Such a fun layout!! Love the misting effect!!! Great colors...super fun!!! Love your layout. It is so full of color and engery. TFS and a chance to win. Your misting + the tiny jewels make a great background for the page! I really like how you outlined the speech bubble too. TFS! Love the masking and use of mists. Terrific layout! Wow - what a great layout. So full of color and 'fun'! WOW!!! Really cool techniques and great effect!!!TFS!!! Oh, I love that layout! Bright fun colors, love the splotches of paint, and the wonderful way you have placed those cute embellies! Wonderful use of those circle masks, too! Love this idea! May have to use it in my next layout! Love it and love the misting. Beautiful job! Wow! Looks so fun and positive! What an adorable layout! TFS! Cute layout! Love the misting! Love the way you combined so many different lines and made them work together. I agonize over making things coordinate, this has made me wonder if I try too hard and just need to loosen my reins a little bit!! Love love love all the misting too! and also the way you mixed all the lines into one lay out...VERY CLEVER! Hi Mahlin, wow, you are so creative and artistic, I need to give that a try. Just wonderful. I love your masking and splatters. Very nice layout. Oh! I love your layout!! The bright colors and unique look makes it really stand out. So adorable! Wow, what a stunning LO. Love the misting and ink drops! This is lovely! 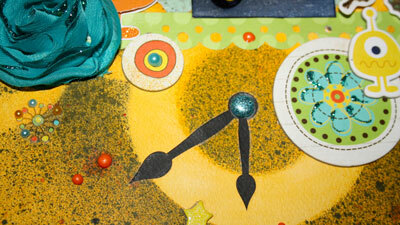 I especially like how you created the clock using negative space. Detta är härligt! Jag gillar särskilt hur du skapade klockan använda negativa utrymme. I loved colours used in your layout !!! Du måste ha fått flest komentarer so far!!! Wow! Love how you used the mists to spatter the background...beautiful! Your layout is very cute! Fabulous layout--I like the clock hands. I like your work, very bright! Wow, your layout is so eye catching! It's wonderful!